Home » Health, People & Places » PM Barrow to seek medical attention in the U.S.
Prime Minister Dean Barrow hopes for an answer from Elvin Penner by tomorrow. It’s not exactly an ultimatum, but the PM leaves the country en route to LA on Wednesday. The purpose of the trip is partly official, as Barrow will be meeting with Belizean-Americans, but the PM will also be consulting on his health – his back, to be more specific. For weeks now he has been experiencing chronic and acute pain. He hopes that doctors in LA may be able to help. Lol! We no sorry fu you. Always hiding behind your back. It’s so screwed up because of all the dirty scandals you have been carrying around for 6 years. Don’t worry, u don’t have my sympathy. As for the electrical device, they should insert it into your brain so u can come out of your delusional state. Belizean don’t believe a damn thing u are telling them. They have pass judgement on you and your fellow crooks! No need to go to the Appeals Court on this one. Trust me! will you meet Eric Change on this trip? Is Eric or Elvin coming back to Belize? will anyone be running the country? All those medical expense coming outa Belizeans pockets. This just shows that Barrow can cover up and smack the people in the face saying ” See, I can do anything I desire”. the ship is sinking and the rats are jumping ship. blood in the water, the sharks have arrived. who is going to jail and who is not? what will then next government look like? Will it be a unity government, compelled by the people to account for the criminality? 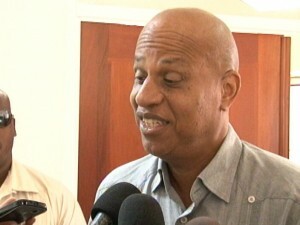 What about trying to improve the medical facilities in Belize PM? How nice he can afford to go to LA for treatment. The poor people of Belize has to sit and take their lumps depending on the inept medical system that exist in the country. How many women died from cancer because they could not get proper treatment, his wife lived because he could send her away for treatment. Please people demand more from this government.